Last Friday, a crew from Laurent Leblanc was working on our road. I was out in the morning with our very old dog (who does not leave our property anymore), when I noticed that our neighbour’s dog had accidentally gotten out. The dog was jumping up at the front door and then running to the gate to the back yard and then running back to the front door. She obviously wanted to be let in. I thought to myself that as soon as my dog was finished and back inside, I would walk over to my neighbour’s house to knock on their door to let them know that their dog is out. But as I was waiting for my dog to finish sniffing around our yard, a very kind man on a small steam roller turned off his machine and walked up to my neighbour’s house. He rang the doorbell and let my neighbours know that their dog was out. I was so touched by his kindness. I yelled “thank you” across the street and waved at him. When I came back inside, I told my children about this act of kindness. I asked them if they would like to make a thank you card for this nice man. My daughter, who loves to draw, jumped at the opportunity. She drew this lovely picture for him. 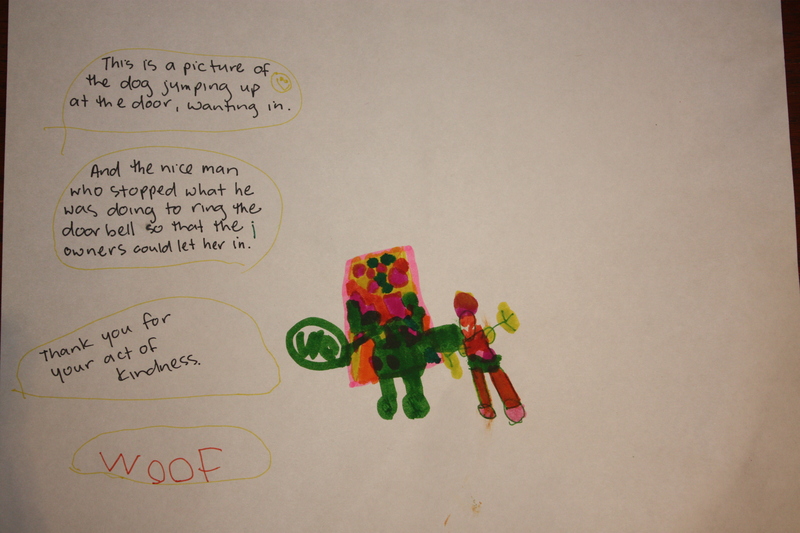 It is a picture of the door (with polk-a-dots), the dog jumping up and saying, “woof” (the dog is green for some reason), and the man ringing the door bell. We were hoping that the crew would still be working on our road as we walked to school, but they had already finished up and had driven away. So today I called the company. I spoke to a nice woman named Chantal. I told her the story and said that we would like to mail this thank you card to the man who did this act of kindness last week. Chantal said that if we mail it to her attention, she will make sure that it gets to the nice man. She was very happy that we were recognizing this act of kindness done by one of the employees at her company. Her happiness made me feel happier – which is the magic behind completing acts of kindness! Our School Added a “Report Bullying” Button on Their Website. One Parent Had a Fantastic Response to This.